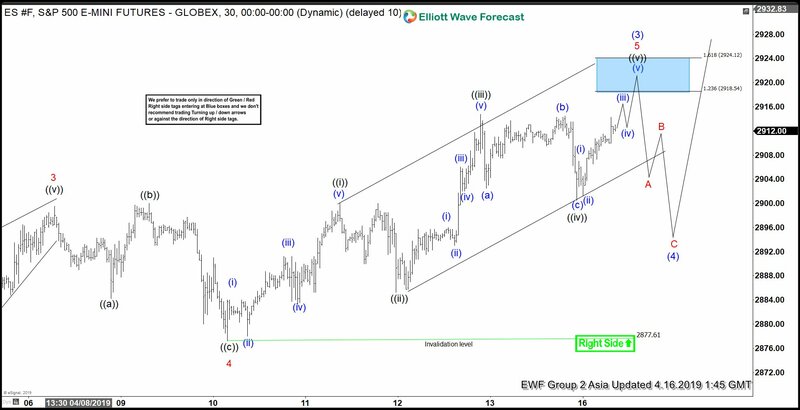 Discussion in 'Technical Analysis' started by Elliottwave-Forecast, Mar 7, 2017. In today's blog, we will have a look between the relationship of the Dollar Index and the Mexican Peso. 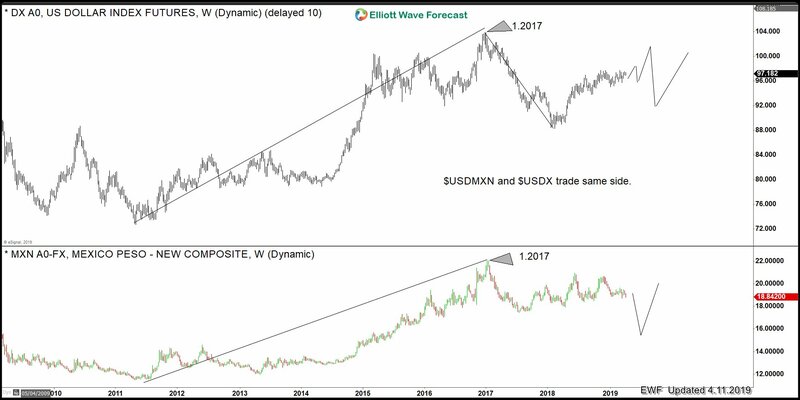 The USDMXN has been trading in the same direction as the Dollar Index and both have peaked in January 2017. As you can see in the following chart below. 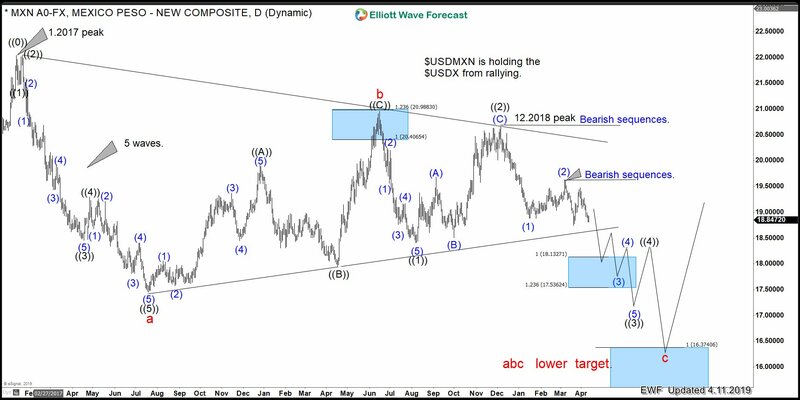 The USDMXN developed a 5 waves decline from the January 2017 peak. Accordingly, to the Elliott Wave Theory, that means that the sellers are in control. Because after the 3 waves pullback, there should be more downside to completed an ABC pattern. 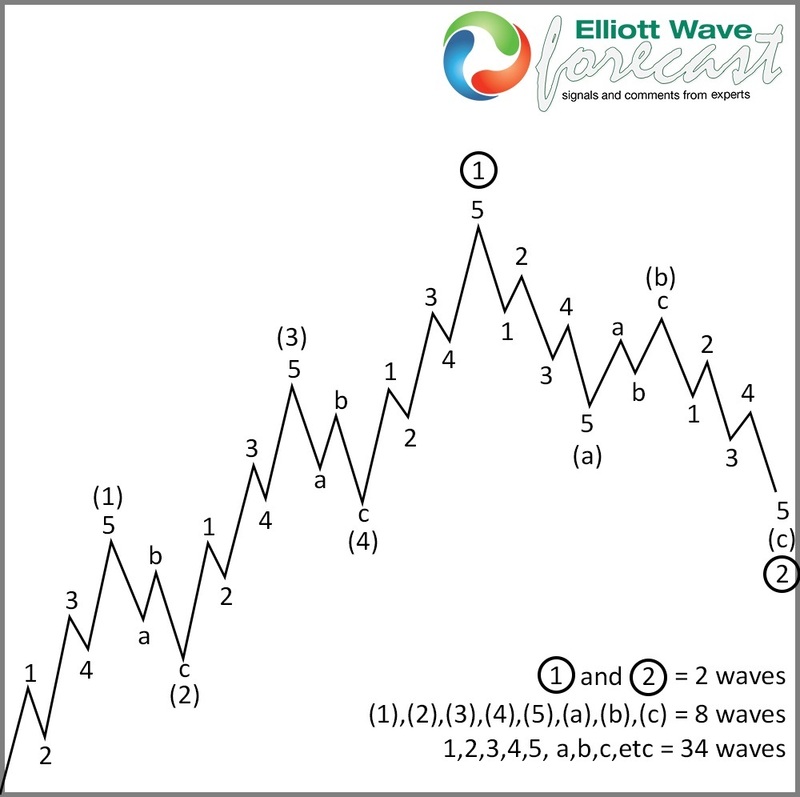 Which is an Elliott Wave Zig Zag structure as the internals has been unfolding as a 5-3-5. The chart below illustrates the Theory. Now let's have a look at the USDMXN in the daily chart. Below you can see the Elliott Wave Theory labels presenting the ABC idea. The Mexican Peso clearly unfolded as an impulsive structure from its January 2017 peak. And it ended the 5 waves impulsive structure in the red wave a. Then it did a 3 waves correction higher in red wave b. But it was expected that sellers should take over at our blue box extreme area. Which came at around 20.406-20.988 area. From there it reacted nicely to the downside and created another 5 waves lower. The Peso has topped at the 12/2018 peak. Which is the same peak in the Dollar Index. Below from there, it opened another leg lower breaking the 1./2019 low. Creating 2 degrees of bearish sequences with the target of 18.13-17.53 area first and then 16.37. In conclusion. Any rally in the USDX should ideally fail below 01/2017 peak. Until the USDMXN reaches its extreme area at 16.37. From there the next big rally in the USDX should take place. 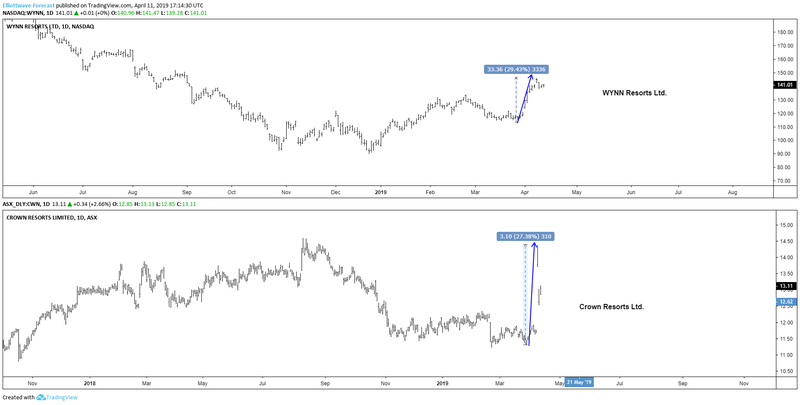 We at Elliottwave-forecast understand that many traders do not use this kind of correlation. But our system is based on many components. Which included cycles, sequences, correlation, Elliott Wave and High-Frequency Trading (Blue Boxes). We always make an effort to locate "The Right Side". Therefore, we look at many related instruments because of the Market Nature which acts as a whole. Short term, expect the Index to extend higher towards 2918.54 - 2924.12 to end wave 5 of (3). Subdivision of wave 5 is unfolding as a 5 waves impulse of lesser degree. Up from 2877.61, wave ((i)) ended at 2900 and wave ((ii)) pullback ended at 2885.25. Rally to 2914.75 ended wave ((iii)), and wave ((iv)) ended at 2900.50. Wave ((v)) of 5 is in progress towards 2918.54 - 2924.12. Afterwards, Index should end wave (3) and pullback in wave (4) to correct cycle from March 25, 2019 low before the rally resumes. The pullback in wave (4) is expected to stay above March 25, 2019 low (2790.25) for further upside. We don't like selling the Index. Looking at the company’s Fundamental situation, its return on Total Capital is 23.43 and its Return on Invested Capital has reached 20.60%. Its Return on Equity is 29.33, and its Return on Assets is 16.76. 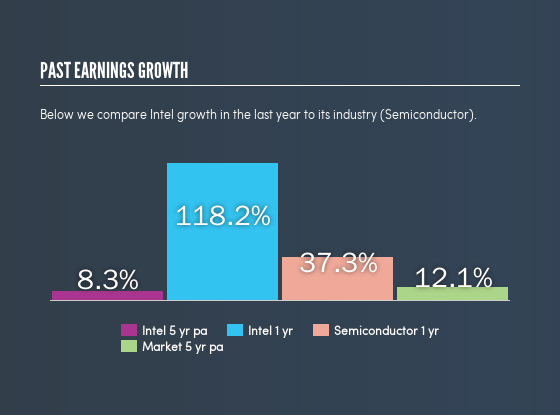 Intel's year on year earnings growth rate has been positive over the past 5 years and its 1-year earnings growth exceeds its 5-year average (118.2% vs 8.3%). All the above metrics suggest that Intel is well organized in using the earned money to generate more returns which is reflected on its stock performance as it remains one of investor's favorite. Based on Elliott Wave Theory, INTC is rallying in an impulsive waves structure since 2008 low and cycle is extending higher within the strongest 3rd wave. As presented on the Monthly chart, the stock is looking for the target area at $61.24 - $67.05 to end wave III followed by a pullback in wave IV then again the stock will resume the move higher. Consequently, the mid-term focus will be on the current cycle from October 2018 and December 2018 lows. INTC is already showing 5 waves up from $43.35 low and reached the minimum target area $59 - $63. Short term buyers needs to be careful at this stage as 3 waves pullback can be seen due to take profit. In today's blog, we will have a look at the latest price action of the Blackrock stock. The stock is listed in the S&P500.